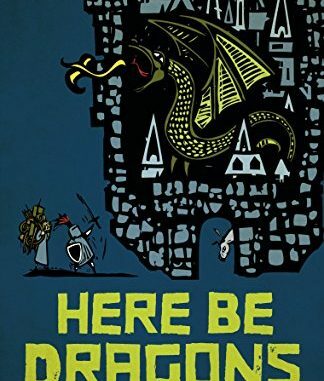 Here Be Dragons is a fun read. If you like Pratchett or Adams, you’ll probably like this. It begins with our hero Orus, newly out of Hero Academy, who has just rescued a damsel in distress from the clutches of an evil sorcerer. It’s not long before Orus is married with a young son, and finds that heroing isn’t a steady gig to support a family on, so he becomes a gardener to the king. The marriage is a happy one, but he looks back wistfully at his days as a hero. Twenty years later, twenty years older and balder and fatter, Orus gets a chance for another adventure. Not to slay a dragon, but to save the last dragon in the world. This is a comedy, but it’s a charming one. MacPherson deftly avoids the pitfalls I feared. Orus isn’t just a buffoon, he’s maybe not the dashing blade he was in his youth, but he has the wisdom of years to go with his aching joints. The supporting characters are fun, there are a few nice memorable villains and enjoyable encounters along the way. As a man who used to be a hell of a swordsman myself a number of years and a few pounds ago, I found this to be a thoroughly enjoyable read. The voice is terrific, the characters relatable, the story is fun. The writing has a few instances where it gets a bit clunky, but the narrative carries it through. If you want a fun, witty, comic fantasy with a heart of gold, pick up this book. Even if you aren’t an old, fat ex-hero, you’ll enjoy it.